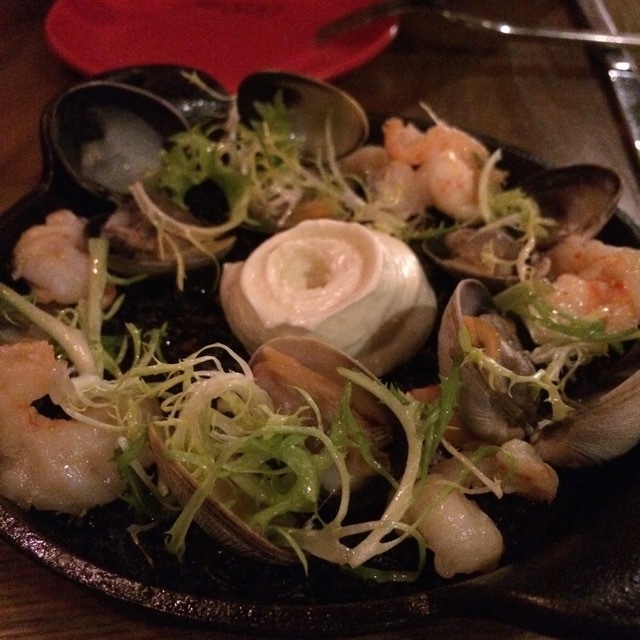 After our trip to Spain, we were hankering for tapas-style Spanish food and remembered that we were overdue for a visit to Beso Bistronomia, a Spanish-influenced restaurant that opened last August in the Castro district. Set on the ground floor of a an old Victorian house, the stylish eatery features a multi-room layout with an exposed brick wall, concrete floors, banquettes and rustic tables and chairs. It’s the second restaurant owned by Nick Ronan and Damien Chabaud-Arnault, who also own the nearby French-inspired Bisou restaurant. Both of the “kiss” restaurants are supplied with fresh produce grown by Napa Kitchen Farms. The owners brought in a new partner, Anthony LeMortellec, chef de cuisine of Boqueria in New York, to consult on the menu. 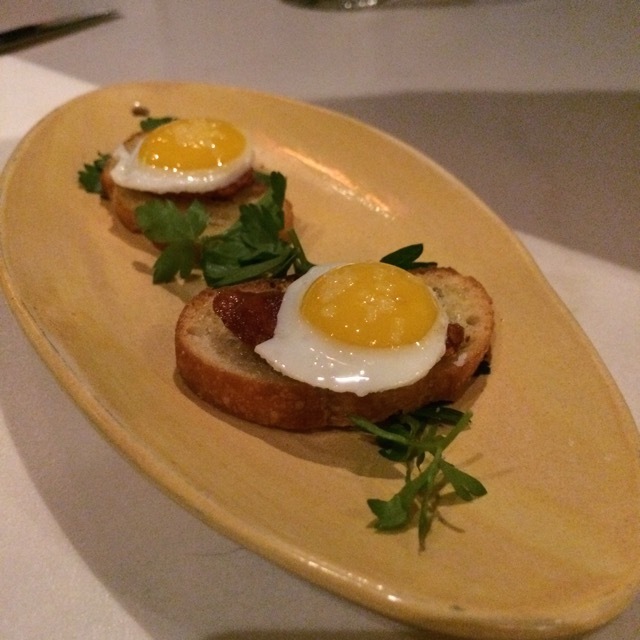 It shows — it’s one of the most authentic Spanish tapas-style restaurants in the City. Beso doesn’t have a full bar, but their beer, sherry and the mostly-Spanish wine list is fairly extensive, offering a choice for every palate. We like our Tempranillo and they have nearly ten of them on their menu. Over a few visits, we have drank some nicely aged and very reasonably priced bottles, including a 2006 Federico Paternina Marques de Valparaiso Crianza (left) and a 2007 Ribera del DueroLa Mejorada Villalar Oro Castilla y León. The wines had nice acidity to balance the bold tastes of their food, but we did have a nitpick that the wines tend to arrive overly warm (our biggest grievance whilst eating out). The 30+ item menu is divided into Tapas Frias, Tapas Caliente, and Paellas categories. We have been back several times and have almost made it through the entire menu as documented in this post. 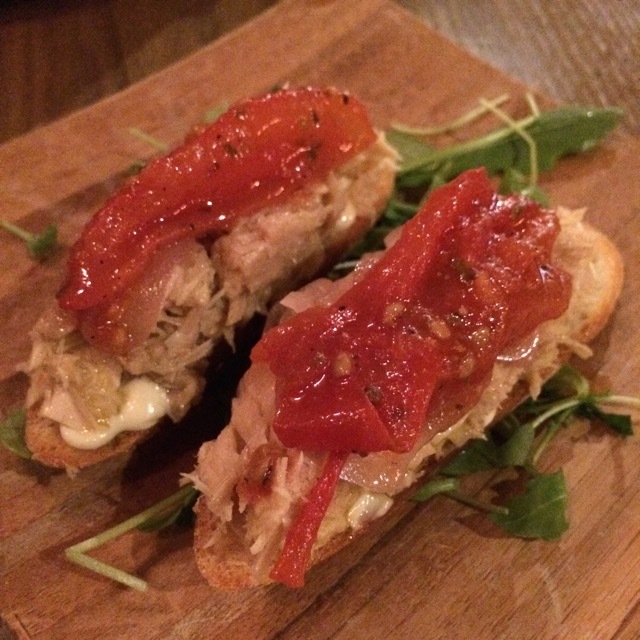 Another winner is the larger-sized Montado de Atun Toast point, which came topped with garlic aioli spread, Spanish albacore tuna, pickled shallots and roasted tomato slice. We moved on to the Charcuteria and Queso section of the menu, each offering six to seven different selections. 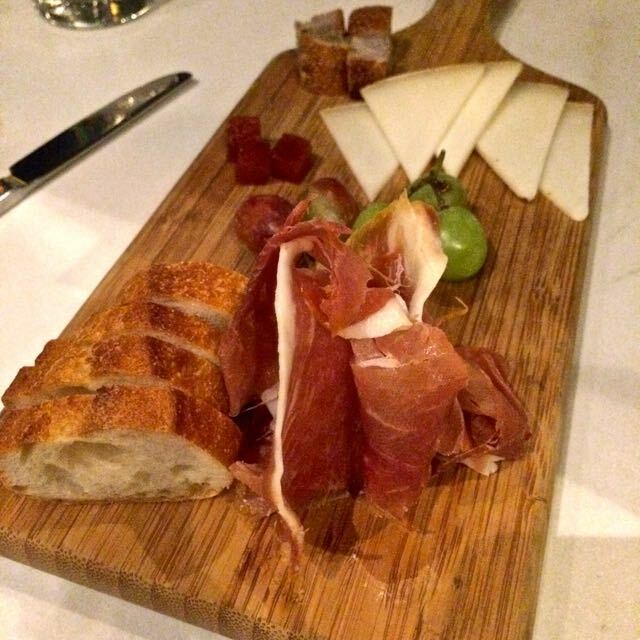 We started with Jamon Serrano and Roncal cheese made of sheep’s milk. 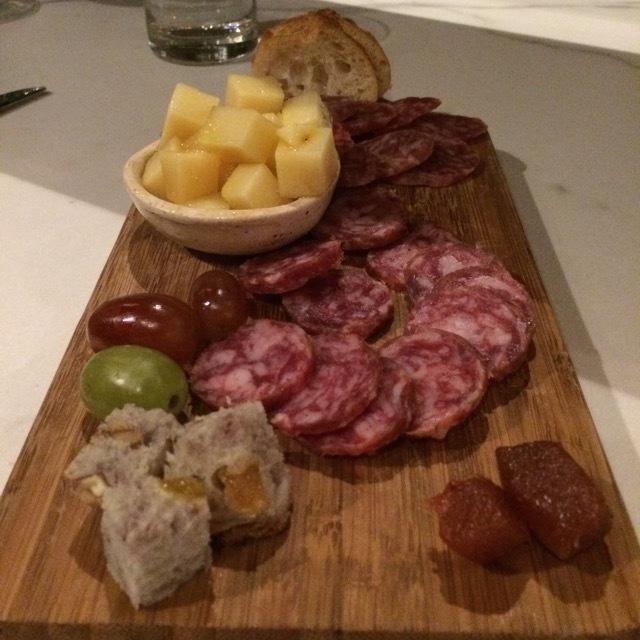 They both arrived on a single board accompanied by baguette slices, housemate walnut bread, quince paste and grapes. On another visit, we ordered a couple of their sausages: Fuet Catalan (cured dry pork sausage) and Salchichon Iberico (Acorn-fed spiced pork sausage). We also took an order of Idiazabal sheep’s milk cheese that they house-cure in olive oil and citrus. All three of the items were very reasonably priced at $6 each with generous servings. The Tapas Caliente menu is further subdivided into Meat, Vegetariano and Pescado sections. 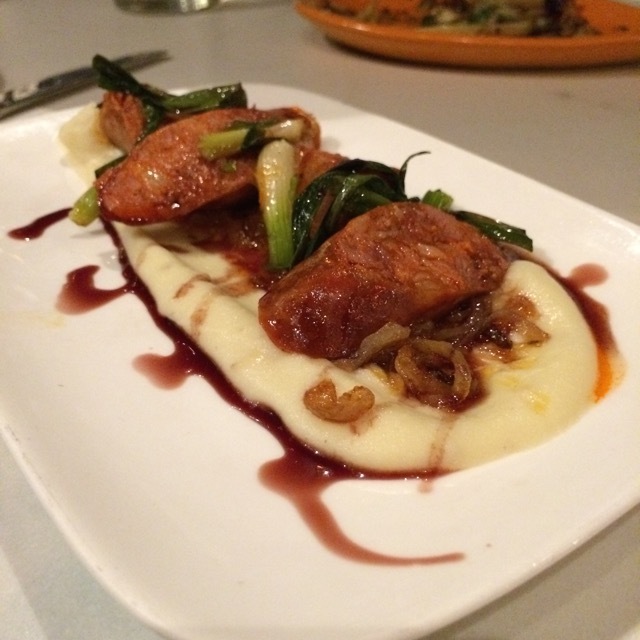 We gravitate to all things pork, so we decided to get the delicious Chorizo con Tinto which featured seared soft chorizo, sunchoke purée and scallions drizzled with a red wine reduction sauce. The Setas from the vegetarian section featured tasty roasted wild mushroom coated with egg yolk then topped with shredded manchego cheese, chives and lemon zest. One day we will try their Paella, but the small order of Fideua was excellent, containing a generous amount of shellfish. Squid ink-blackened thin noodles were topped with Manila clams, plump shrimps and garlic aioli. The dish, which can be ordered in a larger portion, was authentically Spanish — it might have been better those we have had in Spain. 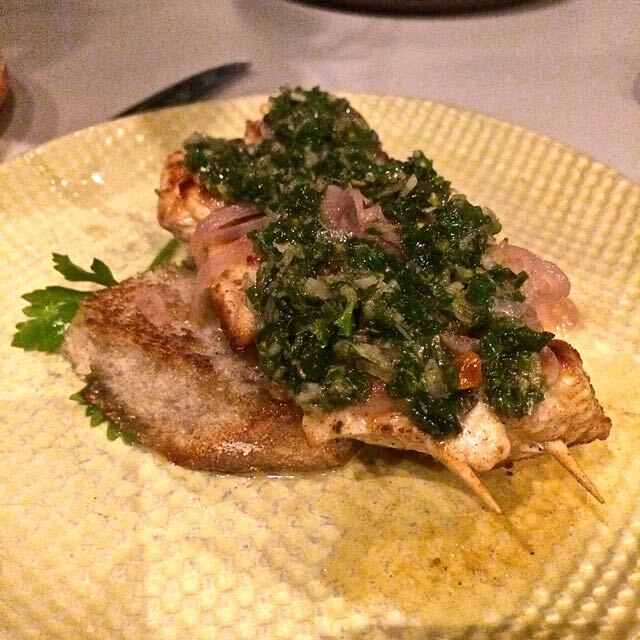 The Carne a La Plancha arrived at our table perfectly rare. 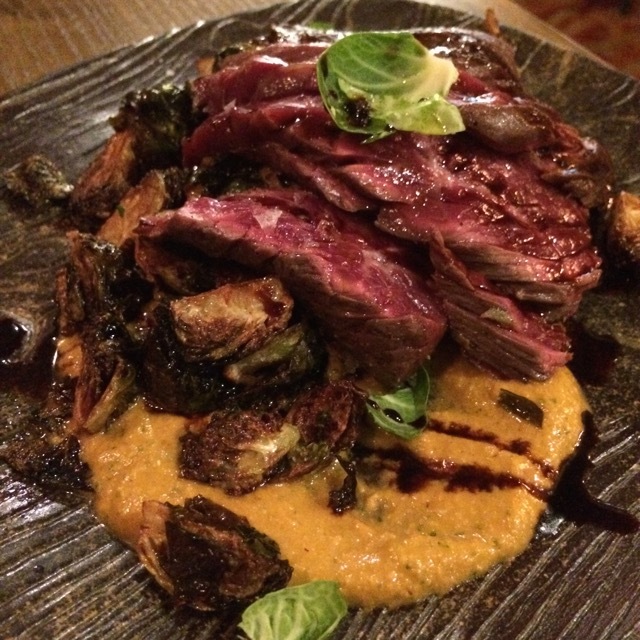 The tender hangar steak was accompanied by crispy brussels sprouts and a killer hazelnut romanesco sauce. The dish was seductively drizzled with Arrope, a Spanish sweet grape must syrup that added just hint of sweetness to the beef. 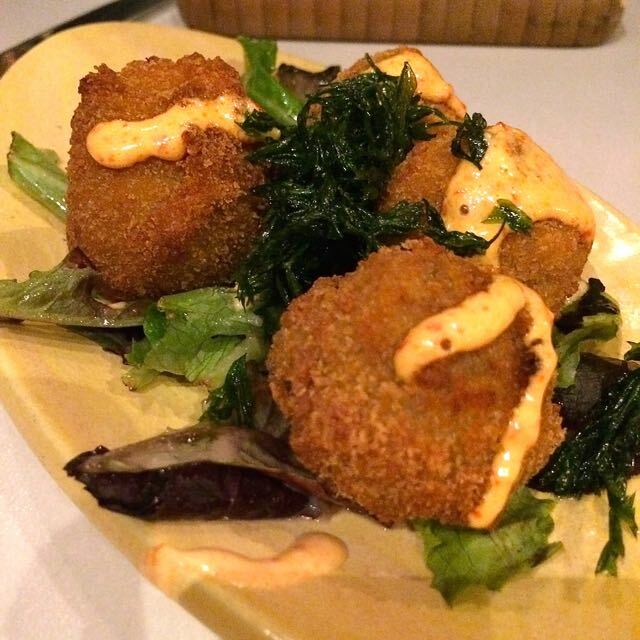 They sometimes have a Daily Specials menu, and on one visit they offered Croquetas de Champinones. The truffled mushroom croquettes drizzled with a pepper aioli were so good that we wonder why they’re not permanently on the menu. 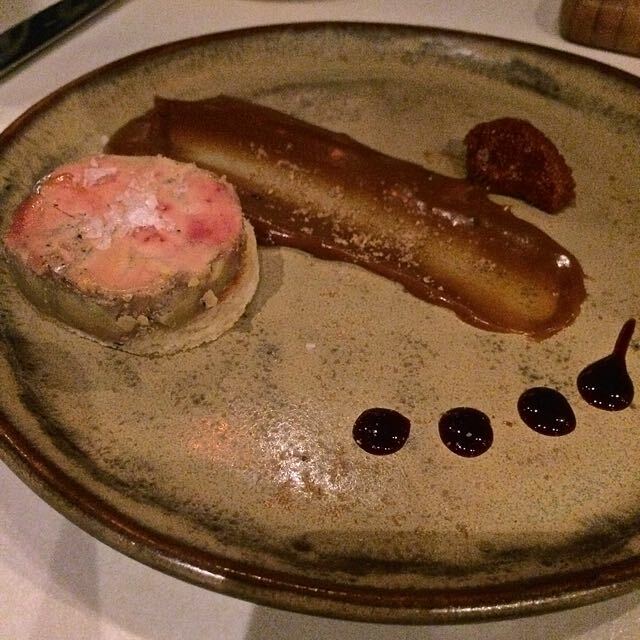 Another special that we jumped on right away was a the Higado de Pato: a foie gras torchon served on brioche toast. We thank the courts for repealing the ban on foie gras so that we can enjoy one of our favorite delicacies in California again. Accompanied by chorizo Iberico jam and a cumin caramel sauce, each bite was savory, sweet and spicy when all consumed together. 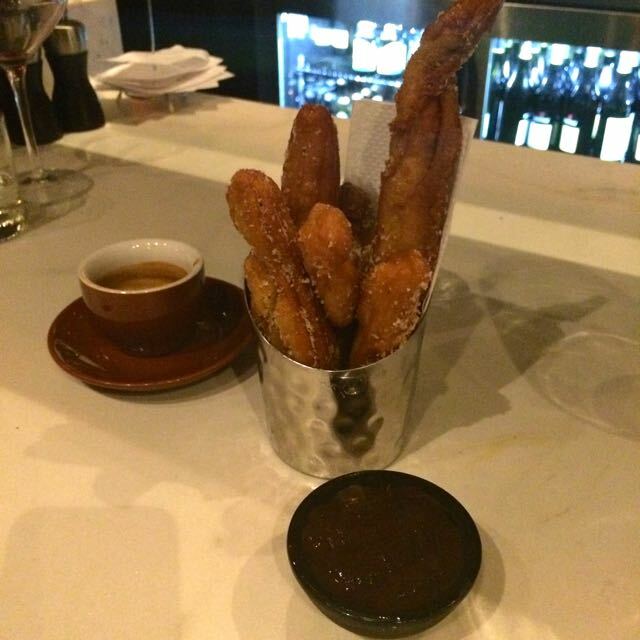 It’s rare that we order dessert, but we had to get the Churros with chocolate sauce on one of our visits. The fried treats were light and airy, and the dark chocolate sauce had the perfect amount of sweetness. Weekend brunches are also great with a small selection of their tapas available along with some larger Spanish-influenced egg, meat and sandwich plates. 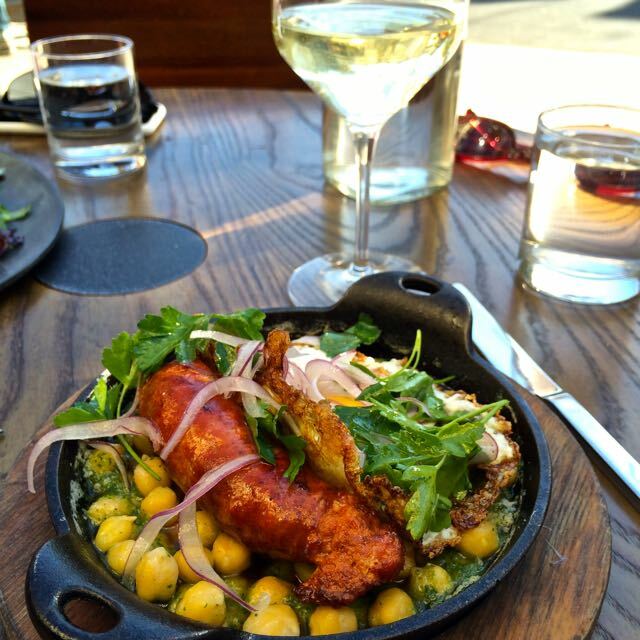 The seared fresh Chorizo sausage is accompanied by a fried egg, and both are set atop a cazuela dish full of garbanzo beans and salsa verde. 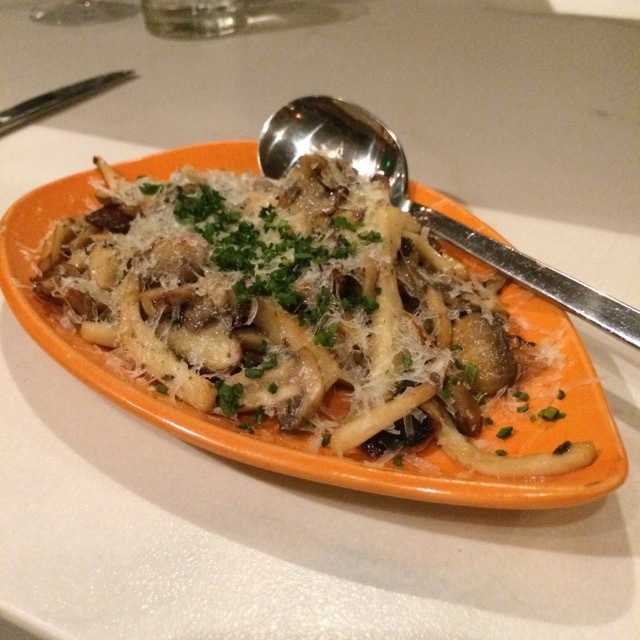 The dish may look small, but it is quite hearty. The Beso Burger is a good one, especially since it is accompanied by a small bowl of their delicious Patatas Bravas (fried cubes of Yukon gold potato served with a spicy tomato sauce and garlic aioli). 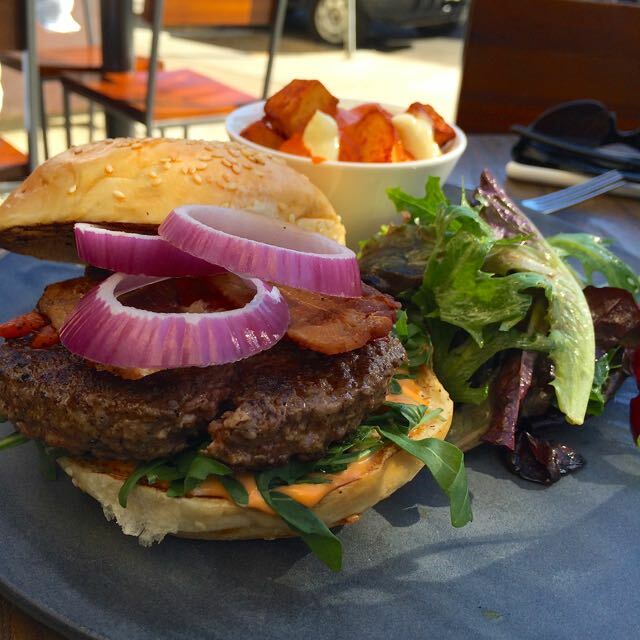 The tasty grass-fed burger is topped with pickle pepper aioli, arugula, onions and mixed greens. We know we’ll travel back to Spain, but until then we’ll get our tapas fix at Beso, especially with it just down the street.